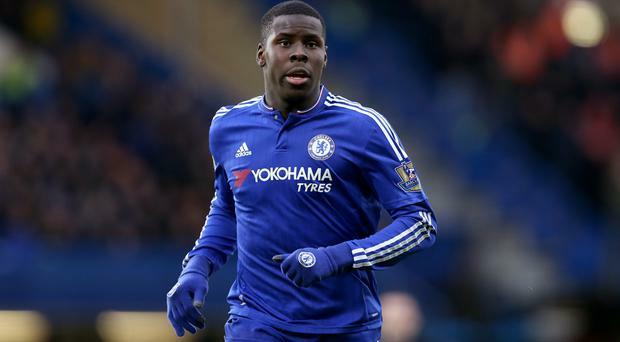 Kurt Zouma could be on his way to Everton. Barcelona and France winger Ousmane Dembele, who was said to be interesting Arsenal briefly on deadline day. Deigo Godin was the subject of interest from Manchester United. Harry Maguire is a target for Manchester United but is staying with Leicester. Mateo Kovacic has joined Chelsea on loan. Premier League clubs were scrambling to bring in their final signings of the summer across transfer deadline day. Here's all the action as it happened right up until Everton confirmed their last signing on Friday afternoon. Scroll down for our live blog. Everton enjoyed a busy end to the transfer window with four players signing for the Toffees including a season-long loan move for Chelsea's Kurt Zouma which was only confirmed after 4pm on Friday. The 23-year-old Frenchman had been linked with Manchester United on Wednesday evening but now Everton have agreed a loan deal. He will wear the number five shirt at Goodison. Their first signing was Brazil international Bernard, who has joined Everton on a four-year deal worth a reported £150,000 a week from Shakhtar Donetsk after personal terms were agreed and a work permit was received. The 25-year-old was in the Brazil panel for the 2014 World Cup but has not played for his country since. For the duration of transfer deadline day, Barcelona's Yerry Mina and André Gomes were reported to be closing in on moves to Merseyside, undergoing medicals amid discussions with the club. A fee of €30.5m with €1.5m in add-ons has been agreed for Mina, while Barcelona have included a buy-back clause. Barcelona has also confirmed that Gomes will go to Goodison on loan with the Toffees paying a €2.25m loan fee. The Toffees had even been linked with Manchester United's Marcos Rojo but that rumour came to nothing. Danny Ings has signed for Southampton on a season-long loan ahead of a permanent move next summer. Ings had an injury hit time at Anfield and wanted to leave in search of first team football. Turkish international Çağlar Söyüncü becomes the third defender to join the Foxes this season, subject to a work permit. The 22-year-old, who was said to be interesting Arsenal and Manchester United earlier this year, will arrive on a five-year deal. He adds to the signings of fellow centre-backs Jonny Evans and Filip Benkovic this summer but still, Harry Maguire remains at the club, who rejected Manchester United's approaches. The south coast side pulled off three late signings including former Barcelona full-back Martin Montoya. Fulham were rumoured to be targeting the Valencia player but Brighton swooped. Their other signings are Dan Burn from Wigan and 17-year-old midfielder Peter Gwargis from Swedish side Jönköpings Södra IF. Meanwhile, Man United's pursuit of a defender was frustrated despite FIVE players being linked during the day. Manchester United were said to be making late pushes to sign either Tottenham's Toby Alderweireld or Leicester's Harry Maguire but the chances of those deals going through vanished. The duo were the club's top defensive targets all summer and 29-year-old was said to be keen to leave White Hart Lane. Bleacher Report (via the Express) do claim that the player has agreed terms with United but the problem is Spurs value the centre-half at £60m, even if a clause in his contract means he could leave for £25m next summer. Leicester have repeatedly made it clear that Maguire is not for sale, even if they have signed Turkish defender Çağlar Söyüncü and Croatian Filip Benkovic today. United saw two bids rejected recently, the higher worth a reported £60m. United did make a late attempt to sign Diego Godin but it's now reported that was under orchestration from the player's agent. The club are thought to have been approached by the Uruguayan's representative, who was told to take MUFC's interest back to Atletico Madrid but within hours, the 32-year-old was said to be signing a new deal in the Spanish capital. There was more fun being had in Claude Puel's presser as the Leicester manager mentioned United's interest in Maguire. "I can confirm he is going to Manchester," he began, "but only for a few hours (to play for Leicester against United on Friday evening). "We have been speaking recently with the chairman and we cannot change our team just before a game just before the new season. It’s not possible. We have to prepare this season. It was important to give Harry the feeling to come back into a squad with good strength and good ambition." Bayern Munich's Jerome Boateng was also linked earlier this week but those came to nothing with the player said to have turned down the move. However, BBC's David Ornstein moved quickly to claim the rumours are unfounded. The Gunners did not make a move for Croatia defender Domagoj Vida, despite rumours to the contrary. Chelsea signed Kepa Arrizabalaga from Athletic Bilbao for £72.1million in a world-record transfer for a goalkeeper. Thibaut Courtois has been unveiled after his dream move to Real Madrid. Bilbao keeper Kepa has headed to London as Courtois’ replacement, joining the Blues in a seven-year deal. Belgium keeper Courtois only had a year left on his deal and has been absent from training this week as he looked to push through a reported £35million move before the transfer window ended for the Blues and their Premier League rivals at 5pm BST on Thursday. Courtois’ move to Madrid has been completed with a six-year contract signed and as part of that deal, Mateo Kovacic's season-long loan move to Stamford Bridge has been confirmed. Manchester City have signed Melbourne City's wonderkid Daniel Arzani. He's set to go out on loan to Celtic. Tottenham ended the window as the only Premier League club without a summer signing as they did not return for Aston Villa's Jack Grealish. The Daily Star have reported that the former Republic of Ireland international will instead sign a new deal at Aston Villa. Tottenham had a £25m offer turned down earlier this week and now he's expected to double his £20k-per-week wages at Villa Park with a new contract that will include a clause allowing the player to leave if Villa fail to land promotion this season.